If you're anything like me, you're currently sitting in your living room with your TV tuned to ESPN so you can watch the 2017 NBA draft. I don't normally watch the NBA draft, or any or other sports league draft, but this one promises to be particularly exciting for a number of reasons, most notably the intrigue and controversy surrounding LaVar Ball and his son Lonzo Ball. If you have no idea who LaVar Ball is, he's sort of like Kris Kardashian on steroids in the sports world. LaVar made international headlines a few months ago when he demanded a $1 BILLION shoe deal to represent his three sons, the oldest of which, Lonzo, is expected to be picked second in the draft by the Lakers. When every single shoe company laughed at LaVar's $1 billion offer, he went ahead and launched his own line of shoes dubbed "Big Baller Brand" which was basically a flop. It's been extremely entertaining to say the least. Overseeing today's draft festivities is NBA commissioner Adam Silver. Generally speaking, Silver has been a very popular commissioner during his short tenure. So who is Adam Silver? What is his net worth and how much does he get paid to be NBA commissioner? Adam Silver was born on April 25, 1962 in Rye, New York. He attended Rye High School and then Duke University. He went on to earn his law degree from the University of Chicago, following in the footsteps of his father, who was also a lawyer. He worked as a law clerk and as a litigation associate at Cravath, Swaine, & Moore, a law firm in New York City. In 1992, he began working for the NBA. He began his career with the NBA as Special Assistant to the Commissioner. He eventually rose through the ranks, becoming NBA Chief of Staff, then Senior Vice President of Entertainment, then President of NBA Entertainment and then NBA Deputy Commissioner. Silver was anointed the heir apparent to former commissioner David Stern in October 2012. He officially became commissioner after Stern retired on February 1st, 2014. 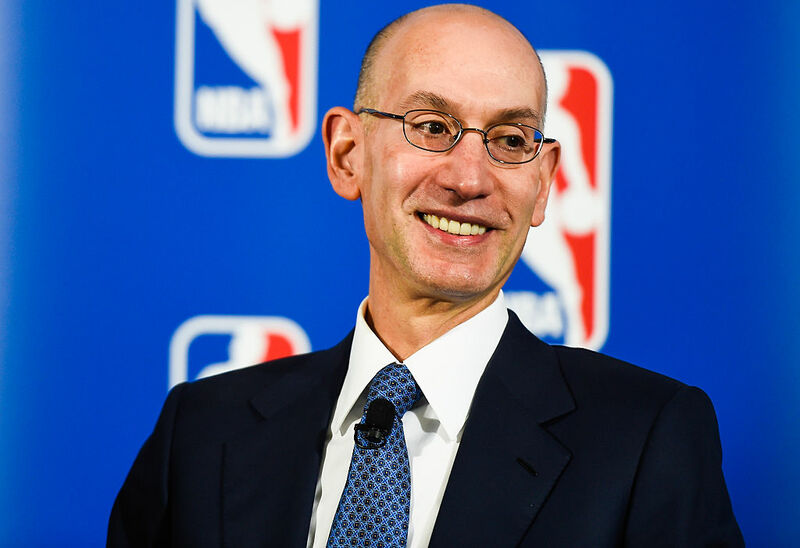 In June 2018, the NBA extended Adam Silver's contract through the 2023-2024 season. He also gets perks like free tickets to every single NBA game ever and he gets to shake hands with future super stars on draft night. It's a good gig if you can get it… but you might need to wait another 20-ish years. Lavar Ball has an ambitious idea to create a league for high schoolers who want to make money off of their talents right after graduation. Lavar Ball may have caused his son to miss out on millions of dollars in a shoe deal.